A budget work session is scheduled for Wednesday, April 17, 2019 beginning at 5:00 p.m. Meetings are broadcast live on the cable government channel. They are broadcast again at 2:00 a.m., 9:00 a.m., and 7:00 p.m. daily. You can now watch Waynesboro City Council meetings on line. Please visit the Youtube Channel for the latest meeting broadcast and past meeting videos. Council meetings are televised live on the Government Access Channel. Recorded meetings are then shown each day at 2 and 9 a.m., and 7 p.m. on the Government Access Channel. Council meetings are also available to view on line 24/7. The Waynesboro City Council encourages the participation of all City citizens. For those with hearing loss or speech impairment, please notify the Clerk of Council (540-942-6669) of any accommodations required at least five days prior to the meeting you wish to attend. 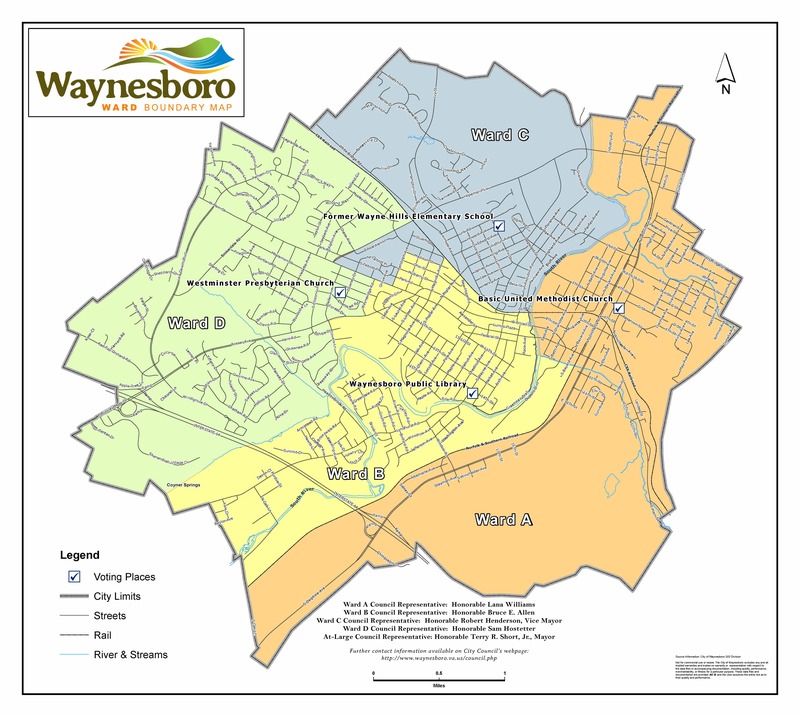 Waynesboro operates under the Council-Manager form of government. The council-manager system combines the strong political leadership of elected officials in the form of a council, with the strong managerial experience of city manager appointed by City Council. It is a representative system where legislative power is focused in the elected council and the professionally trained city manager oversees the delivery of public services. In addition to the city manager, the council also annually appoints the clerk of the council, the city assessor, and the city attorney. The five-member council is elected for four-year terms and members are elected on a staggered basis. Four members are elected to represent wards and one member is elected at-large. The council elects the mayor and vice mayor from the council for two-year terms. All registered voters are eligible to vote for all members of City Council. The City Council approves the budget and determines the tax rate. The council also focuses on the community's goals, major projects, and long-term considerations such as economic development, land use development, capital improvement plans, capital financing, and strategic planning. The city manager makes recommendations to council, and the council may adopt them, modify them, or reject the recommendations. The city manager is bound by whatever action the mayor and council takes. How do I bring an issue before City Council? Is there a Council member assigned to my neighborhood?